Hi readers, I can't wait to share the words and photos in this post today because I've got the fabulous stopping in to teach us her tips and tricks on styling and photographing decor and food at parties. Are you ready to hear her 10 tips? Take it away, Leela! Hi cattledogs readers, Leela here. The most important thing hosting a fete, be it for 2 or 20 people, is to remember that it's just really all about the company you keep -- not the perfection of the food or styling, so relax a little, embrace imperfections and make time just to enjoy the conversation and connection. So here are my tips for styling a party and photographing food! 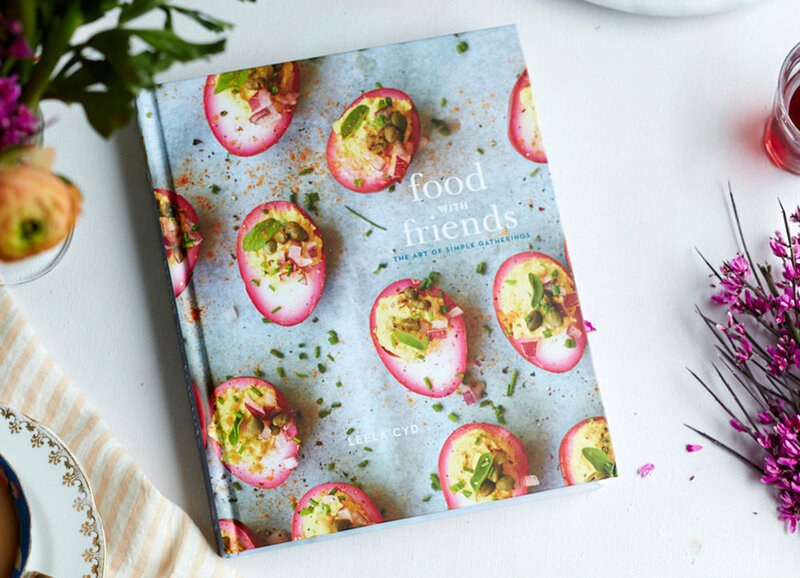 For all of these and more ideas on styling, pulling together your table to already create beautiful food moments, 85 easy recipes that celebrate friendship and fun, please check out my book -- . 1) Decide On a Palette. You can unify a bunch of mis-matched linens and plates if there is a tonal relationship. An easy way to do this is to pick whites or greys and go for a monochromatic look of different items. It really shows off the food this way. An alternate, opposite approach, is to not worry at all about a palette -- because if nothing goes together, everything goes together! This wonky look is quite adorable too. 3) Use Found Objects as Center Pieces. It doesn't have to cost a fortune to have a chic table -- I often clip little blossoms from my neighborhood or gather driftwood from the beach. Wherever you are, take a look around you, what are the natural items you could bring into your table for a pretty table addition. Often it takes absolutely no money, just a little care in gathering some pretty sea glass, pine cones, shells, branches, etc to festoon your table. 5) Style the Plate. Often, I like to use smaller plates in general, this keeps portions looking abundant and allows guests to refill a few times - prolonging the meal and the company. I think of a plate of food as a painting, making sure there are some large shapes in lovely colors -- such as grains dotted with cheese and herbs, a big salad moment with shaved carrots or radishes, then smaller dollops of dips and pickley things, finally garnishing the entirety with a scattering of small herbs, cracked pepper and a delicious, fruity olive oil. Messy is ok! 6) Your food will only ever be as beautiful as your ingredients. Choose high quality, pretty foods to photograph -- this means shopping and preparing food that is as seasonal as possible. Think of the difference between jewel-like farm-stand strawberries and the gigantic, barely red strawberries sold at Costco. 7) Natural light is your best friend. When creating a food spread you'd like to shoot, consider a brunch or lunch party rather than the darkness of dinner. It will be so much more appealing to shoot with indirect window light than the ambient light bulb light that comes on as the sun goes down. 8) Breathe Life into a scene with a person. To really activate your image of food, show a person interacting in some way with the food -- it can be just a tiny suggestion of a person, or it can be clearly of hands engaging in the act of eating or cooking -- either way, it's a sure-fire bet to give that food a story and a 'moment in time' feeling, making the image more relatable and emotional. 9) Look at the food in terms of color, texture, shape and scale. Think like a painter and ask yourself, is there enough variety of plates and glasses (shapes), a good mix of textiles and napkins (texture), is there a pop of vibrancy from the food or another prop somewhere (color) and are there differences in size to keep the viewers' eyes moving around the composition (scale)? 10) Add other interest to the scene. I love to show crumbs, the saucy bits at the bottom of the bowl, a few bites taken out of food, the crumbling sides of a pot on the stove. It's these little actions that help the food look loose, enjoyed and real, instead of staged. For more tips along with lovely food and recipes, purchase today! Thank you so much Leela for these wonderful tips and photographs, we love your book here at cattledogs and are currently reading it and in love! Thank you again and best wishes on your lovely work.